Pioneers in the industry, we offer toasted sesame seeds from India. Our Toasted Sesame Seeds are small tasty, unhulled seeds that are used in cereals, crackers, spreads, drinks, casseroles, granola, candies, soups, salads, fish and baked goods. 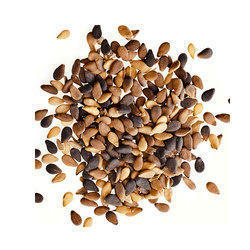 These Toasted Sesame Seeds are delicious when toasted and sprinkled on grains or main dishes. Also Known as tahini when ground into a butter. A nutritious mayonnaise substitute may be made by simply blending sesame seeds with water.